This is a family favorite. 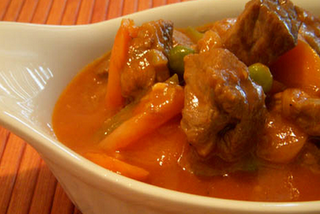 This savory, spicy and warm food is traditionally served with steamed rice. Most people here in America call it a Filipino style beef stew which they often eat it with bread or served in a bread bowl. Marinate beef in dark soy sauce, peppercorn and garlic for at least 2 hours. Fry pieces of beef and potato in olive oil and set aside. In the same pot, saute onion and cook for about 1 minute. Add beef and the marinade, diced tomato, dried chili peppers, and bay leaf. Cover and simmer until meat is tender (about an hour). Add the potato, green peas and red bell pepper. Continue cooking for about 10 minutes. Every time I eat at a Thai restaurant…I have to have chicken satay with peanut sauce. Lately, I crave different styles of satay and came up with this delicious Manenok’s beef satay!!! Marinade beef by combining first 7 ingredients together overnight in the refrigerator. Skewer beef pieces in bamboo sticks. Broil over charcoal. Served with sate sauce and cucumber pickles or papaya pickles. Mix all ingredients in small sauce pan, heat and stir frequently for 5 minutes in medium low heat.